We are all familiar with the standard toolbars available on the Windows Taskbar; Quick Launch, Running Applications Icons, and Notification Area. But few people know how easy it is to create your own custom Taskbar Toolbar. Next, right-click on a blank area of a toolbar on the Taskbar and, in the popup menu that appears, select Toolbars > New Toolbar... to open the New Toolbar dialog box. In the New Toolbar dialog box navigate to the folder containing the applications shortcuts, then click on the [OK] button. 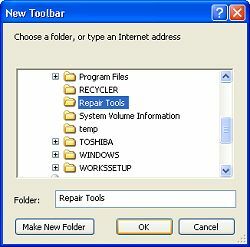 Use the toolbar as you would any of the standard toolbars. If you want to add another item to your new toolbar, just drag the to the toolbar and create a shortcut (a shortcut to the item will be created in the toolbars folder). To remove an item, right-click on the item and select delete in the popup menu that appears. To make your new toolbar into a floating toolbar, right-drag it onto the desktop. To delete the new toolbar, right-click in a blank area on the toolbar and select Close in the popup menu that appears (if you made it into a floating toolbar, click on the [x] in its upper right hand corner). This does not delete the folder containing the shortcuts. 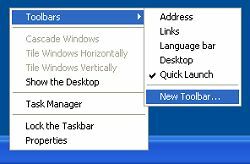 Creating your own custom Taskbar toolbar is so quick and easy that you can easily create one to hold related shortcuts for a specific task and when the task is complete you can quickly remove the the toolbar, keeping the shortcuts folder for when you need to perform the same task again.